All homestays that offer diving can arrange dives at these Raja Ampat dive sites, but please be aware that some of the sites described experience strong currents and require advanced level experience. Western standard medical care is unavailable in Raja Ampat in the event of a diving accident: We strongly recommend you read our article on diving safety in Raja Ampat before committing to diving with any operator. Thanks to Reynaldo Corral Andaluz of Raja Ampat Biodiversity Eco Resort for kindly submitting this article and the Manta Sandy image above. 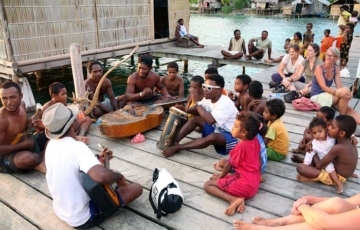 Raja Ampat Biodiversity Resort is located near the village of Yenbeser, on Pulau Gam in the heart of the Dampier Strait and, subject to conditions (see below), welcomes homestay guests unable to arrange diving elsewhere to join them in experiencing these iconic Raja Ampat dive sites. There are numerous options for skin diving in Raja Ampat and each of them is distinct, although some of them share the same marine biodiversity, since they are located near each other. As a diving aficionado and someone who is fortunate enough to live in Raja Ampat, I have had the opportunity to try them all. It would be hard to prioritize one over the others, since each Raja Ampat dive site has its own charms, depending on what you are looking for and what level of expertise you have achieved. At Raja Ampat Biodiversity Resort, we know that many people coming to Raja Ampat don’t have as much time as they would like to devote to their dives. That’s why, in what follows, I’ll describe some of the best sites for diving, from my point of view. One of our clients’ favorite Raja Ampat dive sites is Mios Kun, situated on Dampier Strait, at the southern entrance to Kabui Bay. It consists of a coral column that plunges up to 25 meters deep. It is recommended for beginners or those at an intermediate level, in light of its currents, which are usually light but can occasionally be rather strong. As a rule you can expect is to see many yellow snappers on the reef and, if you dive down a little farther, you can find Wobbegong sharks. There are also seahorses, fusiliers, trevallies, groupers, giant clams, morays and much more marine life. One kilometer south of Mios Kun is Blue Magic, yet another dive site. It is a chunk of reef submerged just 10 meters below the surface, so boats often use it as a safety measure, stopping just above it so they will know exactly where to dive. In Blue Magic the current is strong, so it requires an advanced diving level. Throughout its 30 meters of depth you can see large schools of fish like barracudas, red snappers, surgeonfish, tunas and mackerels. There is also a cleaning station in one of the eastern bommies near the surface, where you can see manta rays. But what you are mainly after is to see manta rays, then I recommend Manta Sandy, to the northwest of Arborek Island. It’s a dive appropriate for everyone, since it is only 18 meters deep, making it ideal for beginners. The currents are variable. In this area there is a large concentration of plankton which, together with the currents, attracts the manta rays. You will see the typical ones, but also some black mantas that are less common. In order to not upset their habitat, please keep in mind that, during the dive, we remain behind the rocks, watching the animals swimming around. We have seen up to 20 manta rays in one dive. 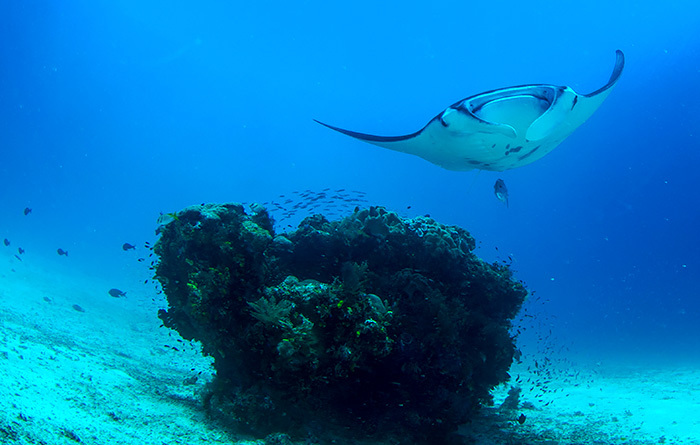 Note: Manta Sandy is a perfect place for snorkellers to see Mantas too, as this short video shows. Video courtesy Anne Astorga, a former Dive Instructor at Yenkoranu Homestay. Another of the main focal points is Batu Lima (very popular with the liveaboard boats), also a favorite of our clients. In Indonesian it means ‘five rocks’ and it is situated in front of our resort, in Dampier Strait, at the southwest entrance to Kabui Bay. It has a diving depth of up to 24 meters with variable currents. Made up of five rocks as its name indicates, they are connected and you can swim between them at high tide. One highlight of Batu Lima is the size of the coral fans. You don’t need to dive far to see them, just a few meters from the surface you can see the beautiful purple colored corals, which many people photograph. You can also see whips of black coral and bushes. But don’t worry; in Batu Lima there are also fish. You can see trevallies hunting other fish or even whitetip and blacktip sharks. For more advanced levels, also near the coast, is Mike’s Point. Situated in Dampier Strait on the Southeast tip of the Gam coast. It is an area very distinct from the others, due to its history. During the Second World War the U.S. Air Force confused it with a Japanese ship and bombed it. The impacts on the rock created grooves in the wall, sort of like caves, where you can now dive. Please keep in mind that it is an area with strong currents and you can descend up to 30 meters so, as I said before, you must be at an advanced level for this dive. 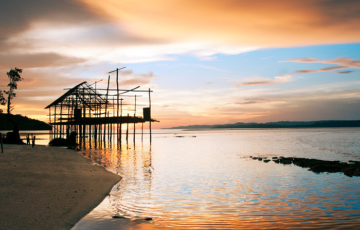 At Mike’s Point, you can see sweet lips tropical carangidi or larger fish like whitetip sharks, tunas or eels. But not everything is on the ocean floor; in the shallower areas, there is a complete coral garden where you can find sea serpents, tortoises, carpet sharks or walking fish. 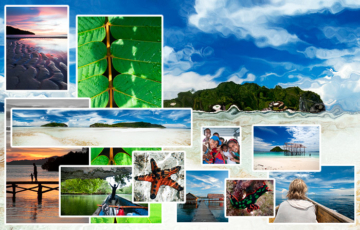 I hope that these 5 Raja Ampat dive sites have whetted your appetite even more, for coming to dive in the islands. The clients of Raja Ampat Biodiversity Resort have preference for renting diving equipment. Everyone diving with us must follow our procedures and carry valid dive accident insurance. Some accommodation providers may levy a commission on top of our prices. Check with your accommodation provider to avoid surprises.